Hardwood floors are wonderful for so many reasons. That's why they're so popular in residential and commercial spaces all around the globe. There are so many things that make these floors great. They're simple and quick to install. They're powerful, tough and resilient. They have straightforward routine upkeep requirements. They offer strong acoustics. They can even promote enhanced indoor air quality. If you love the idea of a low-maintenance floor that's beautiful, hassle-free and healthy, you honestly can't go wrong with hardwood floors. Many people agree with that notion, too. Few people if any will discount the benefits of hardwood flooring. That doesn't mean that these floors are all sunshine and rainbows, however. These floors are just like anything else. They sometimes develop problems. Occasional hardwood floor problems are pretty much inevitable. Irritating and persistent squeaking sounds are sometimes a big problem for people who own hardwood floors. If your floor makes noticeable squeaking sounds any time you walk on it, that can be enough to drive you insane. No one wants to have to hear high-pitched sounds day in and day out. If you want to get to the bottom of your squeaking dilemma, you should carefully assess your situation. An in-depth evaluation can help you determine the potential "bad guy." Numerous things can trigger persistent floor squeaking. The quicker you can identify the cause of the squeaking, the sooner you'll be able to give your poor ears a break. Subfloor troubles are occasionally to blame for squeaking sounds. If your subfloor isn't perfectly level or flat and smooth, squeaking could occur. Subfloor slopes can be problematic. They can stop wood flooring from bending correctly. They can, in turn, lead to difficulties with fasteners. If your fasteners aren't in their appropriate positions, that can bring on a lot of squeaking. Empty spaces that are in the middle of subfloors and hardwood floors can frequently lead to piercing sounds that are in no way pleasant. Fastener shortages are frequently responsible for squeaks. Wood floors contract and grow. They need fasteners for these purposes. If you have a fastener shortage, however, you'll quickly start hearing squeaking sounds. Cupping in hardwood flooring can occasionally lead to unwelcome and undesirable squeaks. If hardwood flooring cups and then reverts back to its prior position, that can be bad news for you. That can mean constant unnerving squeaking noises in your property. Floor cupping can elevate the sides of floorboards. This action can make fasteners significantly less secure. It can, in turn, make them markedly less responsive and successful. That's because it can trigger motion between subfloors and hardwood floors. Nail looseness is a biggie in the hardwood flooring squeaking universe. If your hardwood floor squeaks all the time, loose nails could be culpable. Subfloor sides massage each other when nails aren't perfectly tight. If your nails were put in too rapidly, that could mean that your joists aren't in correctly. Floorboards that consist of nails that aren't suitable for them can also trigger troubling squeaks. If there are squeaking sounds coming from the middle of your underlayment and subfloor, pay attention. That could indicate that you need to swap the nails out as soon as possible. Spacing is a crucial element of proper hardwood flooring installation. If you fail to take note of spacing, that could prevent wood expansion. Insufficient space can force wood to rub metal. If you walk on your floor and hear squeaking, it may be time to investigate your spacing situation in great detail. Problematic fitting can also cause persistent squeaks. If there's any type of problem with the fitting of your groove and tongue joints, squeaking could be a consequence. Joists that fail to receive sufficient hanger support can also frequently bring on squeaking noises. Floorboard shrinking woes occasionally cause hardwood flooring squeaking headaches. Wood has the tendency to get drier and drier with the passing of time. That's totally natural. When it dries out, it contracts. This leads to the emergence of openings. If you want to stop your floorboards from moving around and triggering anxiety-inducing shrinking noises, you should take a careful look at them without delay. 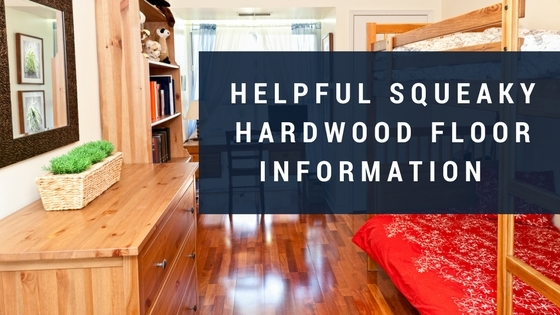 So many diverse things can cause frustrating squeaking in hardwood floors. The possibilities can often be rather overwhelming. Wall interior partitions can sometimes influence squeaking sounds. Problematic gluing techniques can often lead to them. The list is definitely on the long side. If you want to identify exactly what's causing your squeaking situation, you don't have to go it alone. It can be wise to seek professional assistance. A technician who specializes in hardwood flooring can assess your problem. He can then determine how to quickly and efficiently solve it for you. It can be unbearable to have to deal with floor squeaking on a daily basis. It can make basic activities hard. It can make walking around at night quietly next to impossible. It can make the idea of inviting guests over for dinner seem more than a little unappealing as well. If you don't want to have to deal with explaining obnoxious squeaking sounds to visitors who enter your home, you should address your problem without a second of delay. Floor squeaking can interfere with your lifestyle in a significant way. It can make daily comfort seem like a distant memory, too. Global Alliance Home Improvement Products Inc. is a renowned flooring company that's headquartered in beautiful Ontario, Canada. We have offices in Glencairn, Toronto and Wasaga Beach. If you're searching for five-star hardwood flooring Barrie or Toronto home and business owners can trust fully, you can believe in Global Alliance Home Improvement Products Inc. 100 percent. Our choices in hardwood floors are dazzling, diverse and abundant. We give our customers many amazing options in natural, "graphite" and "granite" floors. We give them plentiful incredible options in attractive and inviting floor colors as well. Examples of our available floor colors are golden, deep brown, light brown and reddish brown. If you're interested in hardwood flooring in Barrie, Toronto or Wasaga Beach, you should reach out to our business today.